Morris James LLP was presented the Leadership Award at the Delaware State Bar Association’s Christopher W. White 2015 Distinguished Access to Justice Awards Breakfast on October 29th, 2015. The Leadership Award is given to the firm who has demonstrated outstanding leadership in the field of pro bono service to the impoverished in Delaware, and who fosters a culture which recognizes the value of Access to Justice service. 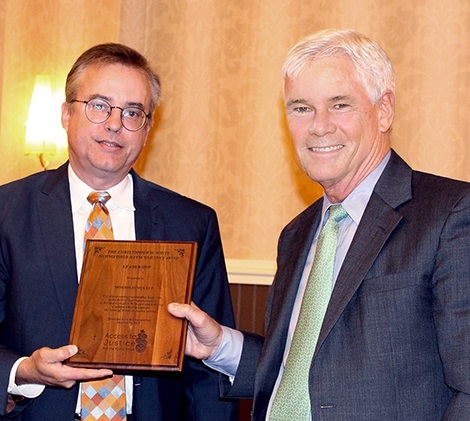 "Morris James is gratified to be acknowledged for its commitment to provide pro bono services to the disadvantaged in Delaware," said Managing Partner David H. Williams, pictured right receiving the award. The Access to Justice Awards are given in the name of the late Christopher W. White, a long-time attorney with the Community Legal Aid Society of Delaware, and member of the Delaware State Bar Association, who was widely known and respected for his advocacy work on behalf of the indigent people of Delaware.